The history of the Army Ordnance Corps can be traced back to the formation of the three Presidencies of the East India Company i.e Bengal, Madras and Bombay in the 15th Century. The formal recognition of Army Ordnance Corps was with the establishment of ‘Board of Ordnance’ on 8th April 1775. This board existed till 1855, after which it was transferred to Secretary of State for War. In 1896, on reorganization, Ordnance State department and Corps was organized into the Army Ordnance Department and Corps for officers and men. In 1918, the prefix Royal was adopted for meritorious service during the First World War. In 1922 the prefix Indian was added and the Corps was named "Indian Army Ordnance Corps". In 1950 the prefix Indian was dropped and the Corps was named Army Ordnance Corps, which is the name today. It was in 1610 that the Moghul Governor of Gujrat granted the East India Company of London the permission to trade at Surat. Eventually, it developed three main headquarters: at Calcutta in 1634 for the area which was later called the Bengal Presidency; at Madras in 1639 for what was to be known as Madras Presidency; and at Bombay in 1639 for the Bombay Presidency. In 1666, the Company arranged to obtain stores of different description from England for improving the fortifications of Bombay. This can be considered the first demand ever made from India for ordnance stores. In 1668, the Company decided to manufacture gun powder at Bombay. Three years later, efforts were made to organise munition workers and encourage artificers, goldsmiths, armourers and other craftsmen to live in Bombay and work for the Company. In 1694, the first Master of the Ordnance was appointed in Bombay to command gunners, mates, artificers, etc. He was responsible for maintaining all the ordnance instruments in serviceable condition, as well as preparation of hand grenades, gun powder and other fireworks In 1746, the Artillery in Bombay, rather its Ordnance was reorganised under a Captain of the Artillery, who was to be assisted by a Lieutenant Fireworker. Under their administrative charge was the Military Storekeeper who procured military stores locally and supplied these after charging a certain percentage of commission. Besides the Military Storekeeper, there were the Director of Laboratory and other assistants. This was the Ordnance Department at that time. It provided and held charge of all accoutrements of war, while the rest of the Artillery manned the guns in the battlefield or elsewhere when necessary, but they did not have them on permanent charge. The prevailing system of three independent Presidency Armies of Bengal, Madras and Bombay had led to haphazard and erratic system of supply of ordnance stores for the Armies. Lt Gen Sir John Clavering, the then Commander-in-chief of the Bengal Army conducted a detailed investigation into the whole method of ordnance supplies and in his monumental report recommended the establishment of a body to supervise the whole function of ordnance supply to be called the Board of Ordnance. This recommendation was accepted and the Board of Ordnance came into being on 8th April 1775. It is generally accepted that the setting up of the Board of Ordnance was the formal beginning of Ordnance Services in India, a fact which is enshrined in the observance of the Ordnance Corps Day on the 8th April. In this sense, it is only too true to call Lt Gen Sir John Clavering, the founder of the Ordnance in India. On 8 April 1775, a Board of Ordnance was constituted in Bengal Presidency, which for the first time created an organisation that could effectively control all the stores of the Company Army. The establishment of this Board of Ordnance was the first real attempt at organising an effective control over military expenditure with a systematic distribution of ordnance equipment and military stores to the troops. This was also the first attempt to have an effective centralised authority over Ordnance. With the British flag now flying over the largest part of the Indian subcontinent, the British forces in the country too had increased considerably. Also with the improved communications, the local distinctions in the armies of the three Presidencies were becoming unnecessary and cumbersome. As a natural consequence, the dispersal of military stores at small depots all over the country was no longer warranted. The Government of India, therefore, constituted a Special Ordnance Commission in 1874 to recommend a more efficient and effective ordnance system. After lengthy deliberations stretching over an year, the Commission presented its report on 7 April 1875. Ordnance stores in arsenals were to be calculated. A uniform system of internal economy and procedures for arsenals and depots was also formulated. Similarly, the number of factories was considered and concentration suggested. So in May 1879, Lord Lytton appointed the “Army in India Commission”, with the object of undertaking a thorough inquiry into the military system in India Here too, the main recommendation was the amalgamation of the three Presidency Ordnance Departments into a single all-India organisation under a Director-General of Ordnance. The Inspectors General of Ordnance for Bengal, Madras and Bombay were to be functionally responsible to the Director General of Ordnance. Another aspect of the Commission’s recommendation was that by and by the factories’ organisation should be placed directly under the Director General of Ordnance. On 1 April 1884, the Ordnance establishments of the three Presidencies were amalgamated into one department, called the ‘Ordnance Department in India’. The Director General of Ordnance, in addition to being responsible for the efficient working of the department, became the official adviser to the Government on all Ordnance matters. The department was divided into three circles of superintendence and supply Bengal, Madras and Bombay each under the charge of an Inspector-General of Ordnance. However, in 1890, the Government bifurcated the Bengal Circle into two circles: Eastern and Western circles of Bengal, each under a separate Inspector-General. The first Director-General of Ordnance (DGO) was appointed on 1 April 1884. The Director-General of Ordnance had a dual role to play. He was basically under the Military Member of the Council and yet had to be an adviser to the Commander-in-Chief on Ordnance matters affecting the Army. 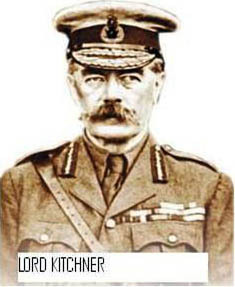 Lord Kitchener took over as Commander-in-Chief in November 1902. He had come to India with a mandate to reorganise the Indian Army and to streamline the army administration. He was of the view that a Commander-in- Chief could not function efficiently if he had no effective control over the administrative service. He was, therefore against the system of dual control of the Military Member and the Commander-in-Chief over military matters. He felt that the intervention of the Military Department in Army affairs was unnecessary and, in fact, harmful; it was his view that the Commander-in-Chief should be the sole authority on military affairs. He warned that “divided councils, divided authority and divided responsibility would lead to disaster. As far as Ordnance was concerned, a majority opinion of the Committee felt that all manufacture and production should be placed under a civil-member of supply. Due to financial difficulties, the report could be implemented only by the end of 1923. The Government favoured the minority recommendation for the appointment of Surveyor-General in charge of production under the Commander-in-Chief. As no suitable civil officer could be found, it was decided to have a military officer, for whom the title ‘Master General of Supply’ was selected. On 15 June 1929, therefore, the office of MGS was abolished and the first Master General of Ordnance in India was selected. On 15 June 1929, therefore, the office of MGS was abolished and the first Master General of Ordnance in India was appointed. With effect from 1 April 1939, the Indian Army Ordnance Corps (IAOC) was made responsible for the entire technical maintenance of the Indian Army in the field. As a result, the technical maintenance of all mechanical vehicles and provision, storage and issue of their spares was made the responsibility of the IAOC. With this, 133 officers, 398 British/Indian other ranks and 2828 civilian personnel belonging to the RIASC were transferred to the IAOC. The Ordnance Corps which at that time had a range of 40,000 items thus acquired another 45,000 items belonging to the then MT vocabulary. This meant more than 100% increase of its workload. World War II brought a tremendous expansion in the whole Army. In Ordnance too, while it had only 10 installations (including arsenals) in September 1939, they increased to 77, at the end of the War in 1945. (a) Appointment of Deputy Chief of General Staff (Weapons and Equipment) had been abolished. (b) Staff Section of the DCGS (W&E)-GS (W&E) became the MGO’s Staff and Co-ordination Section. (c) Scientific Adviser to the DCGS (W&E) became the Scientific Adviser to the MGO-SA/MGO. (d) Control of the following Directorates, with their dependent workshops, installations, depots, establishments, etc. was to revert to the MGO Branch. From GS Branch. The Directorate of Mechanical Engineering (DME) The Directorate of Technical Development (DTD) From QMGs Branch. The Directorate of Ordnance Services (DOS) The Directorate of Ordnance Factories and the factories administered by the DGOF remained under the Ministry of Defence. The Deputy Financial Adviser (Ordnance) became responsible for the financial advise etc. to the MGO and his Directors. The last of the IAOC Gazettes which carried a section for IEME before the birth of Indian Electrical and Mechanical Engineers. 1 May 1943. Indian Electrical and Mechanical Engineers was carved out of IAOC on the recommendation of the IEME Committee. 26 Jan 1950. India became republic. The prefix ‘Indain was dropped and the Corps was re-named as ‘Army Ordnance Corps’. A new Crest was also designed and adopted in 1954.